Hani was out for an evening stroll near Cairo's Tahrir Square when a heavy hand landed on his shoulder. An informant had identified him, and he was thrown into the back of a police truck. There began a seven-month nightmare as he was swept up, along with fifty other men, in the infamous Queen Boat affair that targeted Egypt's gay community. Finally free, but traumatized into speechlessness, Hani writes down the events of his life-his first sexual desires, his relationship with his mother, his marriage of convenience, and his passion for Abdel Aziz, the only man he ever truly loved. In the Spider's Room is a sensitive and courageous account of life as a gay man in Egypt. Born in 1978, Muhammad Abdelnabi is the author of two novels and four short-story collections. His The Ghost of Anton Chekov won first prize in the Emerging Writers category of the Sawiris Cultural Award for short-story collections in 2011. In the Spider's Room was shorlisted for the 2017 International Prize for Arabic Fiction and was joint-winner of the 2017 Sawiris Cultural Award for novels in the Emerging Writers category. He lives near Banha in Egypt. Translator of the winning novel in the Independent Foreign Fiction Prize and twice winner of the Saif Ghobash Banipal Prize for Arabic Literary Translation, Jonathan Wright was formerly the Reuters bureau chief in Cairo. He has translated Alaa Al Aswany, Youssef Ziedan, and Hassan Blassim. He lives in London, UK. 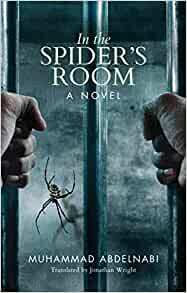 In the Spider's Room is one of the best gay-themed books I've read in many years. It provides a view into a world that is literally and figuratively quite foreign. It winds around the incarceration of gay men following a raid on the Queen Boat in Cairo and the subsequent mistreatment. Dark as this sounds, the book is loosely stream of conscience in that it move from the childhood to the recovery from incarceration of Hani, the chief protagonist. One is brought into the gay subculture of Cairo, with all the risks and joys that accompany this life. It was instructive and very well written, even in translation.